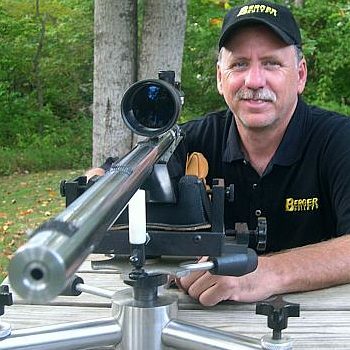 Terry set the new Agg record with the same 6BR rifle that produced Terry’s .860″ single-group IBS record (READ Story HERE). 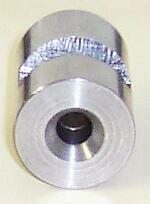 However, the gun has a new Krieger 8-twist barrel and Terry was using the new Spencer 103 BT bullets. In the past Terry shot moly Berger 105s. Recently he switched to shooting naked bullets: “Quite a few boys ’round here have been getting real good results shooting naked bullets lately, so I thought I’d give it a try.” He still uses Berger 105s, but recently tried out the Spencers. In his testing the Berger 105s shoot best in warm weather, but the Spencers shot better in cool to moderate air. At the 7/14 Piedmont match, Terry shot naked Berger 105s in the first Light Gun Relay. That produced a 2.527″ Agg. Then he cleaned his barrel quickly, and switched to the Spencer 103s, loaded with 30.0 grains of Reloader 15. Terry said the weather was pretty mild in temperature, so he thought the 103s might work well. They sure did. Share the post "1.505" 600-Yard Agg — Brady Does It Again"
Rich DeSimone uses a handy “Stub Gauge” for setting shoulder “bump” and seating depth. 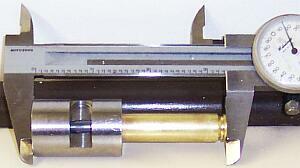 The gauge is made from a section of barrel lopped off when the muzzle is crowned. The chambering reamer is run in about 1/4 of the way, enough to capture the neck and shoulder area of the case. Rich then uses his full-length die to “bump” a master case with the ideal amount of headspace for easy feeding and extraction. He takes that case and sets it in this Stub Gauge, and measures from the front of the gauge to the rim. He can then quickly compare any fired case to a his “master” case with optimal headspace. Since the gauge measures off the shoulder datum, this tells him how much to bump his fired brass. Share the post "TECH TIP–Stub Gauge for Measurements"